The elegant styles of The Jazz Age extend into the style of 1920s jewelry. This was an era where women got a taste for the exotic and these tastes translated to a desire for the bright colors, foreign materials, new angular shapes and a story behind each piece of jewelry. Bright colors were the new aesthetic of the 1920s; the rise of technology, affluence, and ease of travel, brought never before seen colors to the world of jewelry. This color reflected the vibrancy of the Jazz Age. The invention of new materials such as plastic and stones from exotic location introduced an entirely new aspect to jewelry designers. Plastic was strong and resilient, and could imitate natural materials like wood, stone, bone and could be colored to any color of the rainbow. Bakelight, an invention of Belgian chemist Leo Baekeland in 1909, allowed jewelry makers a new freedom in their designs. Rings, necklaces, brooches could all be made to fit any situation or match any outfit. Western society was captivated by exploration in the 1920s. With this rise in awareness came a fascination for the "exotic." The discovery of King Tutankhamen's tomb in 1922 rose the public's consciousness to anything "Egyptian." Typical motifs of Egyptian jewelry were scarab beetles, Pharaohs heads, pyramids, sphinxes, ankhs, and many others. Many of these shapes would be reflected in the Art Deco jewelry of the same period. In addition to the typical symbols of Egyptian culture, women also began wearing jewelry that looked like that of the Egyptian people. Dangling pendants, large fringed bib necklaces adorned with bells, snake bracelets made from glass, gold and silver were all popular items. People loved all things foreign (except maybe the people :). . . from the kimonos of Japan, to the glass of Czechoslovakia, and the native colors and fabrics of Africa all these elements swirled together to create the classic styles and motifs of 1920s jewelry. The straight and simple designs of women's fashion in the 1920s lent itself to expressive jewelry. In 1924, Coco Chanel popularized "costume jewelry" to accent and contrast the straight and simple lines of her fashion designs. Angular pieces adorned womens belts, brooches, sautoir necklaces and hair clips, adding interest and flair to the fashion itself. Like the of 1920s fashion, the jewelry tells a story of a great age. People were fascinated by the exotic, the foreign, the unknown, and inspired by the beauty of "the new." The world expanded rapidly as technology and peoples' desire to explore their surroundings increased. They would return from their adventures with a new discovery and new treasures. 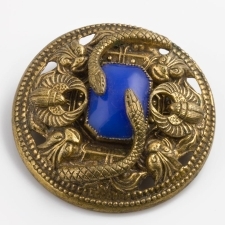 These influence of these exotic finds were reflected in the 1920s jewelry and fashion.